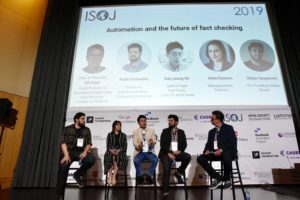 One idea that permeated this year’s International Symposium on Online Journalism (ISOJ) conference is that automation in journalism is no longer a thing for the future. It’s here and working right now, declared chair and presenter Bill Adair on April 12. So instead of fearing changes that may arise in this development, the panel “Automation and the future of fact-checking” explored the possibilities that the technology has on one of the most crucial challenges of journalism today: checking politicians’ veracity. Chequeado is a non-partisan, non-profit organization with the mission to “rise the cost of lying.” The group has been experimenting since 2018 with Chequeabot, a live fact-checking tool that uses automated speech-to-text conversion like most fact-checking tools. Video and television fact-checking make up most of their work. As with many technologies developed in this sector, Chequeado also believes in providing open source tools that can be used by others for further customization. For those willing to try out the Beta version the team is working on, Fernández provided links in English and Spanish. Sérgio Spagnuolo is involved in driving automated fact-checking in Brazil. Not unlike the United States, Brazil is experiencing a rising need for fact-checking in news media after the election of right-wing populist president Jair Bolsonaro. To deliver on that demand, Spagnuolo and his team work with Aos Fatos, Brazil’s biggest fact-checking platform, and its largest newspaper Folha de Sao Paulo. He is also managing-editor of data-driven news agency Volt Data Lab and Truthbuzz fellow with the International Center for Journalists (ICFJ). While there are many automated tools in daily use in Brazil, such as a monitoring bot for Bolsonaro’s Twitter feed, a fact-checking aggregator and a live debate tool, all of them have three principles in common: They’re simple, easy to use and replicable. These principles are, according to Spagnuolo, necessary to successfully develop and distribute new automated tools. Another perspective on the work involved in fact-checking was offered by Day-young Oh from South Korea. He leads a fact checking team at JTBC, one of the biggest cable networks in South Korea. Most of the false claims and fake news they have to check come down to the two central opinion camps in Korea. “It’s about unifying versus dividing Korea,” Oh said. That becomes even clearer considering the portion of fake news that pertains to North Korea in 2018 was about 45 percent. JTBC experienced a noticeable gain in trust from its audience after its coverage of the former president Park Geun-hye’s impeachment in 2016. Trust is also closely tied to visible journalists, such as news anchor Suk-Hee at JTBC. According to Oh, he’s not only one of the most famous men in Korea, but also the most trusted news source. In the United States, the most well-known fact-checking platform is PolitiFact. Managing editor Katie Sanders elicited a laugh from the audience after starting her presentation with a Photoshopped picture of her and Adair drifting “Fast and Furious”-style. Adair created the Pulitzer-prize winning PolitiFact. PolitiFact has developed many techniques used internationally today, such as its famous Truth-o-meter, and has fostered many affiliations with other media outlets, dubbed “the McDonald’s model” by Sanders. Sanders defined their key challenges as follows: Evaluations need to be completed more quickly and more people need to be reached by fact-checking, especially those who need it the most. PolitiFact also wants to expand further into local reporting. A test of Squash during the last State of the Union Address resulted in a positive outcome for the tool that live-checked claims made by President Donald Trump in his speech. Adair said some kinks needed to be ironed out, such as the occasional misinterpretation of some of Trump’s comments, but he was excited about the tool’s future. In accordance with the most pressing needs in fact-checking today, Squash will focus mainly on video and TV content.